The Oppo R7 (£250) offers all the right specs in all the right spaces plus a colourful display to boot, but Huawei's flagship P8 (£495) offers high power, a strong screen and a fancy snapper. So which one wins out? Considering its price, the R7 looks rather smart, its slender (6.3mm) metal body and 2.5D Arc Edge design resulting in a pleasant, premium finish. It's a little tall, though, thanks to navigation keys being positioned below the screen. The P8's metal chassis is just 6.4mm thick, which is pretty impressive when you consider what Huawei has managed to stuff inside it. The handset slips into your pocket nicely, and looks and feels like a premium phone. A five-inch Full HD display, an octa-core processor, 3GB of RAM, a 13MP rear camera and an 8MP front camera mean that these two phones are almost identical. The R7's display – Super AMOLED – is superior to the P8's, though. OK, ready? The P8 has a 5.2-inch Full HD display, an octa-core processor, 3GB of RAM, a 13MP rear camera and an 8MP front snapper. All of that puts it right up there with the top smartphones from Samsung, Sony and HTC. The R7 is a slick performer, taking pretty much anything you throw at it and gobbling it down for tea. Fast charging is a major benefit, especially when you consider that the R7 contains a smaller battery than the P8. There's a huge amount of power in the P8. During general operation, it flies along, while superfast LTE ensures that apps are downloaded in next to no time. However, there's some lag when you present it with more challenging tasks. Android fans will be unhappy that Oppo's interface has removed the app tray, but this does make it easier for first-time users. Sadly, the R7 runs Android KitKat rather than Lollipop, which puts it behind rival handsets. Huawei has tinkered with Android to make it more like iOS, with all your apps living on home screens. Some will love that, others will hate it, but one thing we can all agree on is that the icon design is a little on the childish side. RATES The screen is great and, with its slim profile and metal frame, the R7 is a winner in the looks department. SLATES The operating system is lacklustre, while the cameras lag behind other phones in this class. 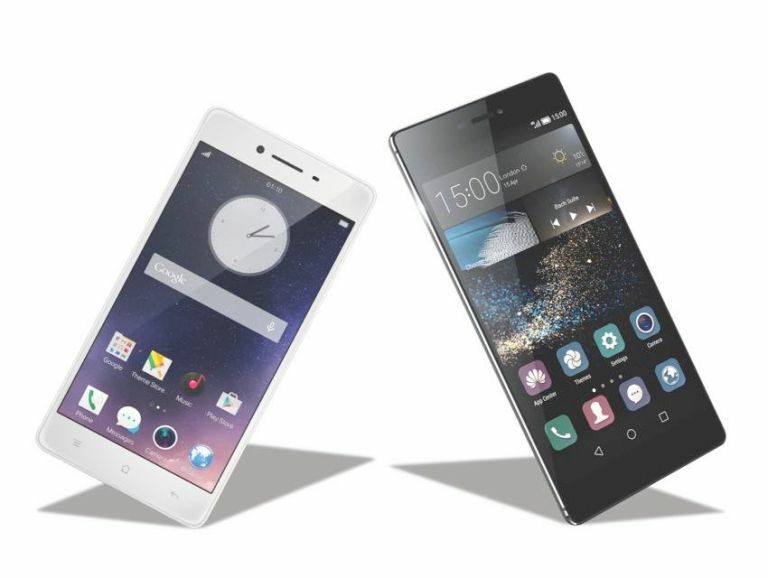 RATES The premium design and strong specs mean the P8 has all the makings of a top smartphone. SLATES The interface is a little hit and miss, and performance under duress can be disappointing.